More particularly described as south of Elkhart, IN on SR 19 to CR 26 (½ mile south of the US 20 Bypass), then 1 mile east to the corner of CR 26 & CR 7, then ¼ mile north on CR 7. Watch for signs. Truck #54 & #56 are located at the Elkhart Co. Hwy. Dept. located at 610 Stevry Ave., Goshen, Ind. These trucks must be looked at and picked up at this Stevry Ave. address. 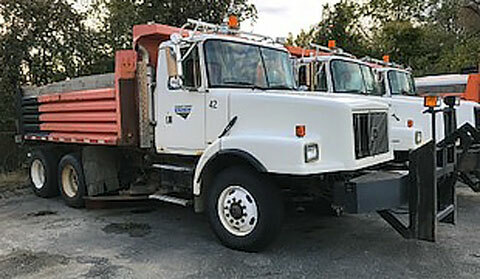 Dump truck #54: 2001 Volvo Tandem axle, rear suspension needs rebuilt, brakes locked up and needs a brake job, flat tires, no driver seat, does not run. Dump truck #56: 2001 Volvo Tandem axle, NO transmission – transmission went out and was removed. 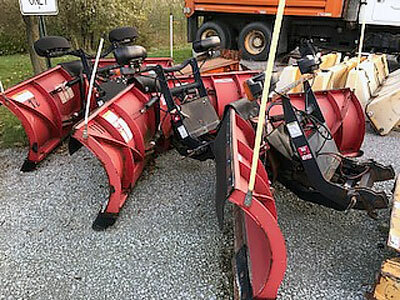 (3) Boss plows: (2) 29'2" & (1) 8'2" for varied pick up; log splitter – needs new engine, on trailer; concrete cutter – not sure of the history on this one; (3) dump truck auger boxes – not sure if they run; (2) dump truck auger pans; (1) insert frame – brand new, wrong one was sent; (1) L-shaped fuel tank – will not pump fuel, needs new switch; (3) Stihl #026 chain saws. 1992 International Model 2674 pumper fire truck with Cummins N-14, 330 HP diesel engine, Allison automatic transmission, 1500 gallons per minute hail pump, 1000 gallon tank, only 38,000 miles.